James Asher, a well-known keyboardist in the ambient/new age music field, has always had a first love for the drums. 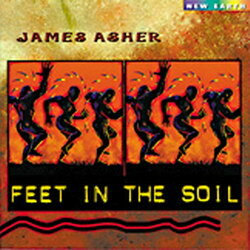 On FEET IN THE SOIL Asher provides listeners with rhythms of infectious, hypnotic and tribal quality joined by didgeridoos, voices, djembe, darabuk, flute, cello, guitars, percussion and more. The two tracks that form the bookends of this album were inspired by Pemulwuy, an Aborigine, whose name means "earth." The tracks in between are an uplifting celebration on danceable energies centered in the earth. Kick off your shoes and get your feet into the soil!